← Two Years Old Plus Turbo Weather! Getting Stoned With My GTI! I’ve been working on a drainage project behind my house. My back yard slopes toward my house, which means that rainwater from the two homes uphill from me collects against my back door and eventually culminates into a river through the garage. Replacing what was likely a 30-60 year old wooden door was a great start. But I needed to divert water from the back of the house. 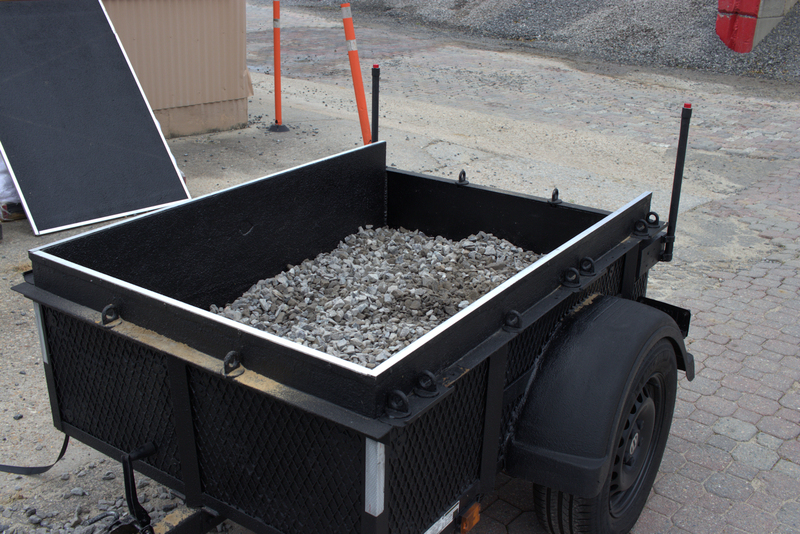 Gravel-encapsulated drains, aka “French drains,” are a popular way to carry out that feat. My aggressive project required thousands of pounds of #57 stone. 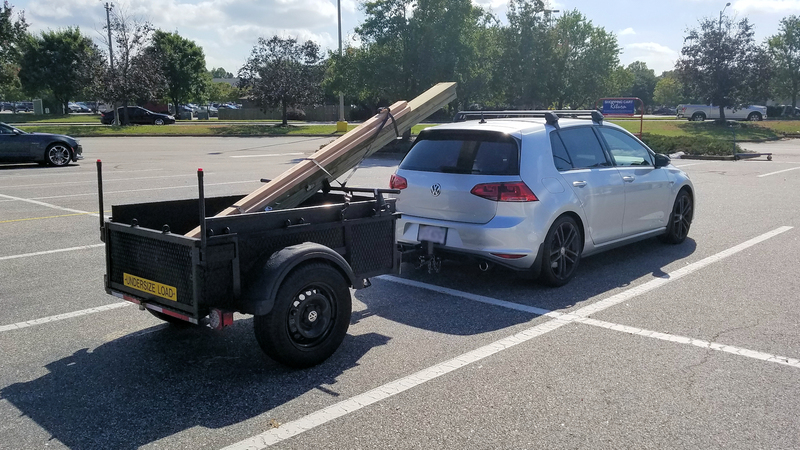 So I put my GTI and baby trailer to work. Remember, I had downgraded my Carry-On Trailer 3.5X5LSHS springs for a softer ride with my usually light loads. That decreased my carrying capacity to 1000 lbs (trailer plus cargo). I decided to put the springs to the test with several trips to Pembroke Stone Mart. I loaded around 900 lbs of #57 stone, which I estimated to be about 200 lbs overweight for the springs. Number 57 stone takes about half of the box when loaded to 900 lbs. By way of comparison, 900 lbs of topsoil usually fills to ¾-full and 900 lbs of mulch usually fills all the way. Of course, extra moisture following rainfall will add weight to the load. I’ll explain how the extra weight eventually took its toll on a spring retainer in a moment. I’m conscientious about my loads and take them seriously. I always strap my loads, cover them, or both. With loads that cannot be strapped, I cover the trailer with a lid to make sure nothing can bounce onto the road and risk damage to other vehicles. The lid also helps with aerodynamics. 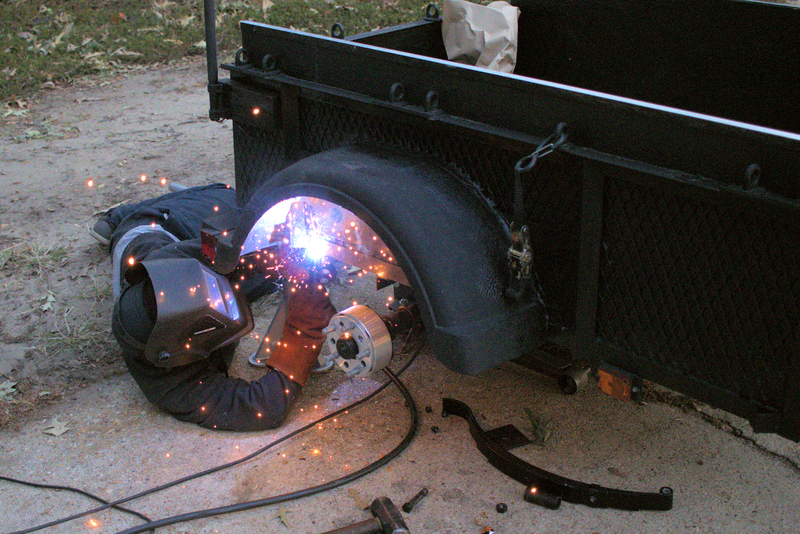 My lid is made from ¾-inch plywood and is strapped to the trailer’s tiedown points. It is highly unlikely to come off, especially since I check and re-tension the straps every time I stop for a break. The lid makes the trailer rain resistant, but not rainproof or watertight since water can trickle past the tailgate. 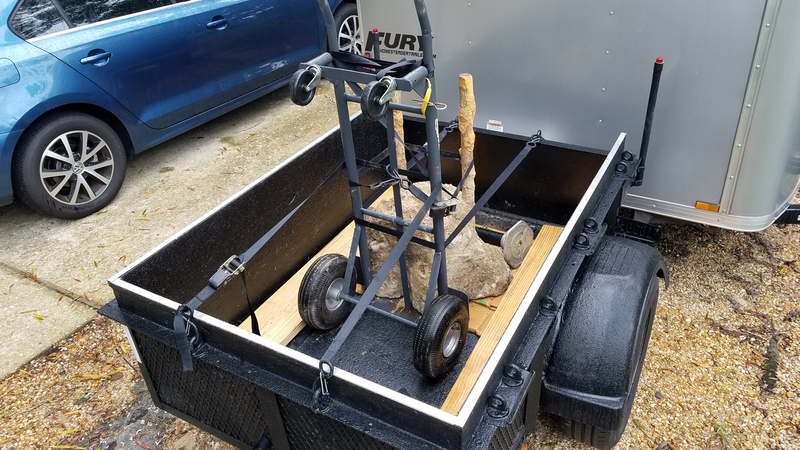 In addition to transporting ~5000 lbs of #57 stone over six trips to Pembroke Stone Mart, I also moved strange loads such as 10-ft long 2x8s for forming a concrete slab, 50 ft of rebar, a 60 year old concrete H-frame anchor (see photo), 1000 lbs of waste dirt, over 200 ft of corrugated pipe, a jumping-jack compactor, and a generator with 20 gallons of fuel (thanks to hurricanes Florence and Michael). That doesn’t include the water and ice I moved in support of two bicycling events this year. I had also planned to move 3600 lbs of concrete mix (four trips). 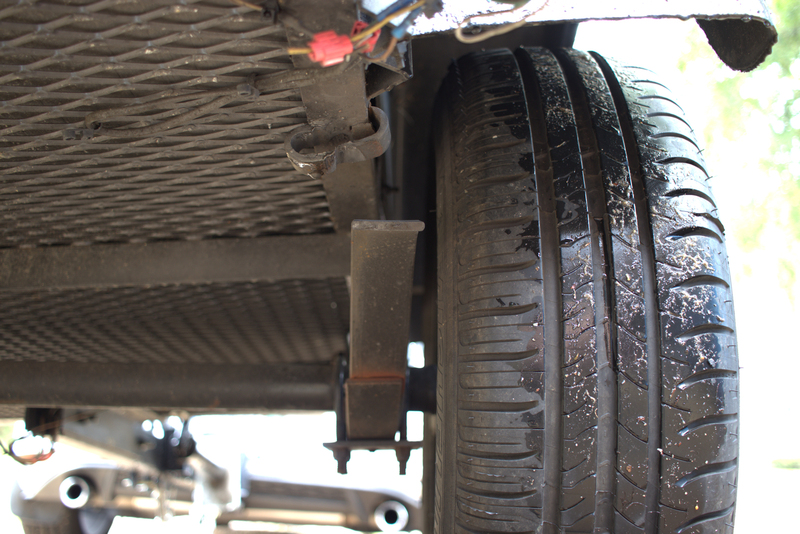 However, a combination of a heavy stone load, the lighter-duty springs, and the oversized wheels/tires contributed to one of my springs slipping out of place and damaging its retainer. I suspect the spring compressed under load, then rebounded sufficiently to hyper-extend and cause it to slip out of its retainer. Unaware of what had happened, I continued to drive while the top of the spring pulverized the retainer until it broke. That’s about the time I started to hear squeaking sounds from the trailer when driving over bumps. 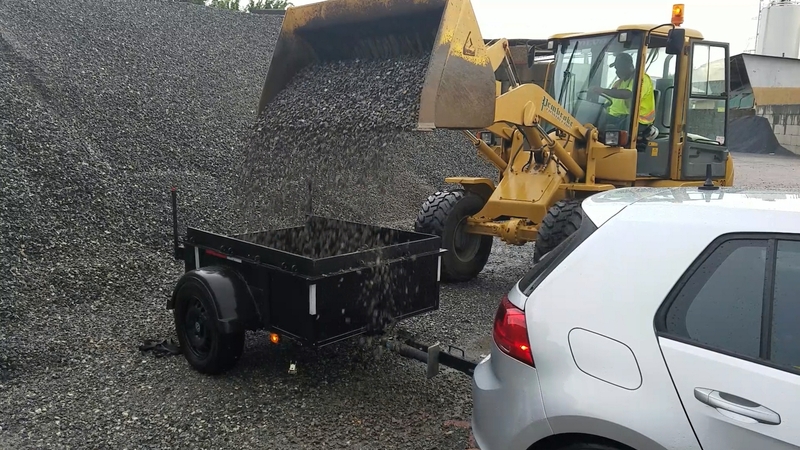 I used my cargo trailer to move the concrete mix while arranging to repair the baby trailer. After having the retainer repaired, I replaced the 500# springs with 1000# springs, which are actually an upgraded spring over the stock units. The factory 1000# springs had two thick leafs, which were stiff. 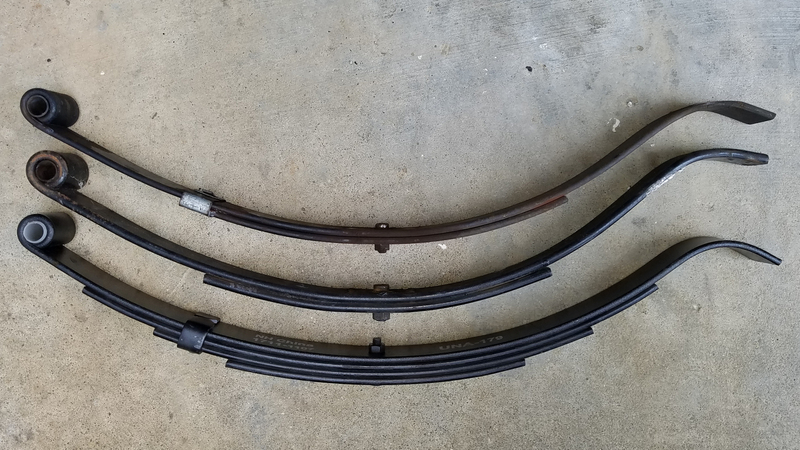 My new springs (shown below) have four thinner leafs, which allows the ride to be more compliant under lighter loads, but then get stiffer as they compress. They’ve restored the full load carrying capacity of the trailer, seem to ride relatively smoothly, and should control the oversized wheels/tires during rebound. Time will tell. Coincidentally, I took my baby trailer to the scales to measure its empty weight. I was surprised to see it tip the scale at 480 lbs! I had severely underestimated how much weight the plywood and larger wheels added to the trailer, which means I had also overloaded the trailer more than intended. The new springs should keep me well within a safety margin. 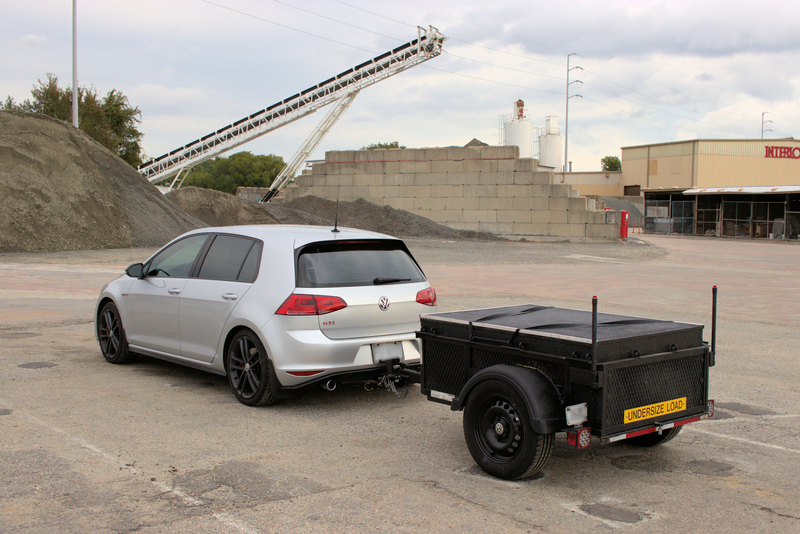 Volkswagen UK, where VW actually publishes towing capabilities, requires trailer brakes when towing over 1400 lbs. I think limiting my cargo to 900 lbs should keep me safe on most roads.